A silver, metallic liquid will be visible from inside the bulb or vial if the thermometer contains mercury. If it does contain mercury, do not throw it away. 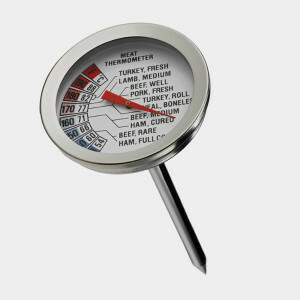 Vintage meat thermometers are more likely to contain mercury, so should never be thrown away. Instead, dispose of these as Household Hazardous Waste. Remove batteries and dispose of them by following these instructions. Then, you can recycle the rest of the digital meat thermometers as e-waste because they contain small electronic parts. If you purchase less mercury, there’s also less of a chance it can be improperly disposed of, which reduces the amount that can leach into lakes and rivers.